These are some of the organisations we have worked with over the last eight years. Each has achieved incredible things with the way it does responsible business. All are now successfully FTTSA certified, and some have gone on to win international awards in recognition of their ‘responsible tourism’ projects. Dyer Island Cruises & Marine Dynamics are sister marine wildlife companies located in Gansbaai, two hours from Cape Town. 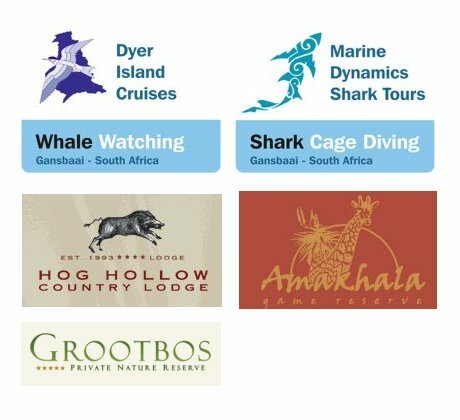 They offer boat based whale watching, shark cage diving and a marine volunteer programme that gives volunteers from around the world the opportunity to participate in valuable research on Great White Sharks and other coastal wildlife. The company is FTTSA accredited, and their motto is to ‘Discover and Protect’. By choosing Marine Dynamics and Dyer Island Cruises, you will be making a difference. Situated at The Crags, some twenty minutes out of Plettenberg Bay along the Garden Route, Hog Hollow has become world renowned for its authentic African hospitality, its signature staff as well as its food and its incredibly warm welcome that is very hard to leave. Amakhala is the only fair trade certified ‘big 5’ game reserve in the malaria free Eastern Cape. With a variety of 4 and 5 star lodges, there will be something to suit even the most discerning client. Amakhala takes its commitment to the earth seriously, and has a dedicated conservation centre, ranger training centre, a 24 hour nanny service to protect its rhinos and its own Amakhala foundation that supports the staff and communities in its immediate vicinity. The five star Grootbos Private Nature Reserve near Hermanus gave me my first opportunity to focus on responsible tourism as a way of creating an inspiring sustainable business because of a strategic committment to responsible tourism.